Booth girls’ costumes have gotten a lot skimpier since the fifties, though I suppose this outfit wouldn’t look that out of place at a Japanese gaming con. 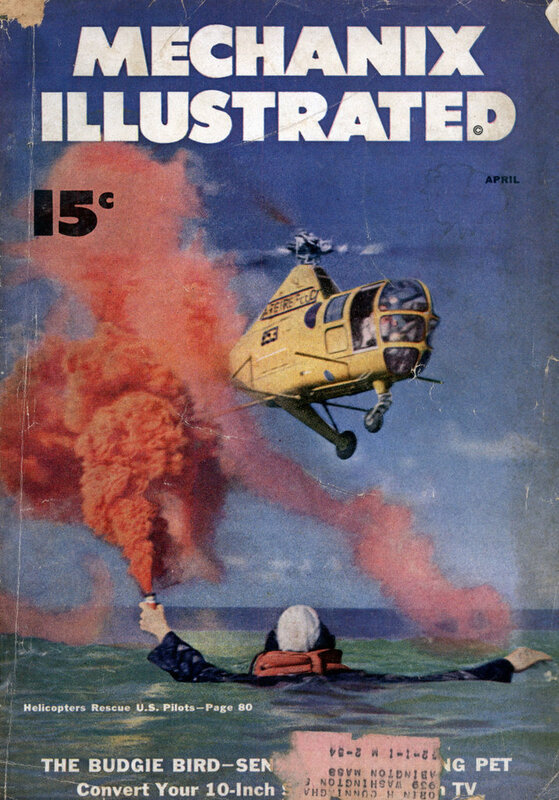 to be foolproof and upset-proof, and can be manipulated by even the daintiest of females as the photo clearly shows. It was shown at the Automotive Industries Show in Chicago. It is the bumper type, screw -driven. Vulcan Mfg., Winona, Minn.
Maybe she’s dressed to sell to the Amish buggy crowd. I mean, it looks nothing like an Amish dress. She is clearly wearing Dutch national costume, except that she seems to be wearing conventional high heels instead of wooden shoes. I had forgotten bumpers were original realy strong and durable. I wonder how long it been since they made a car you could jack up by the bumber. 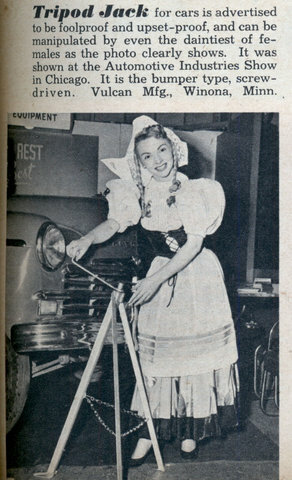 Why exactly would they dress up a girl in Dutch clothing for the Chicago Automotive Industries show? I’d understand if she was selling cheese but…. jacks? A fanatsy comes true; a Dutch maid to jack up my car. John: Yeah, it was just my first silly thought. I realized she wasn’t Amish, but Dutch didn’t really work for the gag. John S: What, no wooden shoes? Mcubstead: Bumper jacks were pretty much all that came with cars till probably the mid 60s. The very vague resemblance of this device to a windmill attrached Dutch girls if you had a flat: especially those in high heels. Anton: Now that’s just reading too much into it. No sin in simply saying “I don’t know”. I had one of those tripod bumper jacks. It was a scary thing. As you raised the car the main support leg moved to a gradual upright position while the the two back support legs slid closer to the main support leg. I kept thinking there must be something wrong with it, but I couldn’t figure out what it could be. I lifted my 1970 volkswgon beetle with it many times and tested the stability and everything seemed sturdy enough. It was just an odd thing that the three legs did not stay put when you used it. The only way you can jack a car up an inclined support is to pull the car forward as you lift it or else the support has to move to an upright position. Was I missing something? That damm jack puzzeld me for years. I finnaly threw it away on a move. Timaay: If you recall, the Big Three bumper jacks of the era were single legged, so I doubt that your tripod doing that was much of an issue. (I’m trying to remember my car jacks. I think it went scissor, scissor, bumper, bumper (Toyo, Mazda, Chevy, Suzuki.)) My current daily driver doesn’t have a jack – few bicycles do. Yeah, either the jack has to tilt or the car has to move forward; it’s just the geometry of it. This is also why floor jacks have wheels. > Was I missing something? That damm jack puzzeld me for years. For those jacks to be stable when lifting a car, you had to leave the emergency brake off. Then, the car could roll and all of the legs of the jack remained on the ground. They worked pretty well, assuming you weren’t lifting the car on a slope, of course. Then you needed chocks to put behind the wheels to keep the car from rolling away. Thanks mike, I just never felt comfortable using it and now its gone so, good riddance.